Whilst out and about yesterday I got to see The Crazies, which opened a little over a week ago. 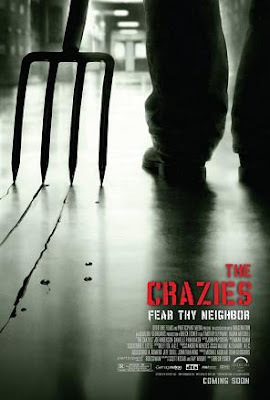 The Crazies was a movie that wasn't quite what I was expecting, but was far better than I had anticipated. I haven't seen the 1973 original directed by George Romero (who also produced this remake) but from what I understand the premise is the same: a military cargo plane crashes near a small town and begins leaking something into the water supply. The "something" in question happens to be a virus engineered for biological warfare. Needless to say, this can't end well for the people of Ogden Marsh, Iowa. Usually decent-minded folks begin going mad with homicidal tendencies. And then like what usually happens in tales like this, the military comes in to mop-up the mess and try to contain the infection before it spreads out into the wider world. I think what makes The Crazies stand out most to me in terms of modern-day cinematic retelling is that this is a film that doesn't use the opportunity to pour on the extra gory. Director Breck Eisner took the road less traveled and made The Crazies a story about survival against the odds, instead of focusing too much time on the nastier things that the virus is causing these people to do. I liked that. It's not something that is often seen in modern horror movies but I appreciated it greatly. By the way, don't leave just yet as the movie ends. There's one more bit of The Crazies that plays during the credits that you won't wanna miss. I'm not a big fan of horror movies, so I went into this movie with some trepidation. I was pleasantly surprised though. To me, the movie's biggest strength is not treating its characters like idiots. Nobody in the movie does anything blatantly stupid. Considering the rural setting of the movie, that could have been an easy trap for the movie to fall into. Combined with that and the low-gore factor you mentioned, I think horror filmmakers should take a lesson from this movie.